erick carlson, Author at Lammon Electric LLC. Over the years of being an electrician, I have seen a lot of bad electrical connections. Some that were caused by loose wire crimp connection or wire nuts, some without any fault to the one who had installed it. I have seen defective materials cause the issues, but there are also a lot of connection faults caused by the one making the connection, which is often the home owner. Electrical connection issues are often just a loose connection that may cause electrical fires in your home. Sometimes the connections are fine, but the terminals are loose and haven’t been tightened correctly. This can cause the same problem and is quite dangerous if it isn’t fixed immediately. 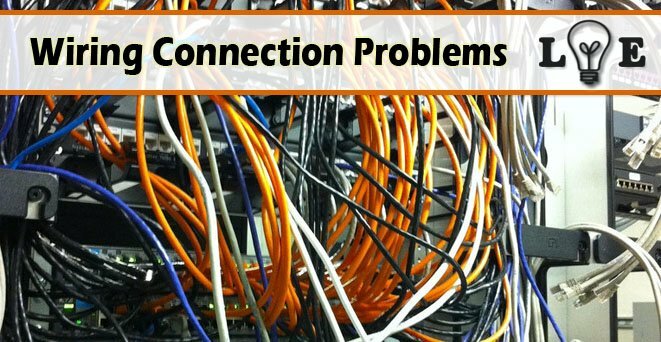 There may be other connection issues that come from loose connections that are under the circuit break terminals. Whenever making a connection to the circuit breaker, ensure that you are stripping the right amount of wire insulation from the wire and making sure that only bare wire has been placed under the terminal screw before you tighten it. A big mistake is having wire insulation under your connection screw. You also want to check all of the neutral wire connections for the electrical service panel. Your neutral wires will need to be connected to the buss bar that is in the service panel. If it isn’t connected correctly it could have similar issues like a hot wire does. Ensure that the wire is sufficiently stripped and placed within the neutral bar slots. Ensure that the connections are tight. You can test this by trying to pull the wire out after you make the connection. Below is a list of common wire connection issues and how you can correct them. As you begin to do more DIY projects, don’t be surprised if you run across a lot of these issues. I am here to help you correct the issues you have in your electrical wire connections. Wire Issue #1 – Electrical wires joined together with electrical tape. This is a classic issue that just makes me cringe when I see it. I have seen this a number of times and there was no wire nut that could firmly hold the connections together. It is one thing to have them twisted and taped together, which is still wrong, but having them untwisted and taped, it is a really big fire hazard. Turn off the power, remove the tape, clean the wire, twist the wires together, and then twist a wire nut over the wires. If the wire ends are damaged, and the wires are long enough to leave around 6 inches of wire in the box, then cut and strip the wires to make a clean splice. Twist the wires together and then add a wire nut to make a secure connection. Wire Issue #2 – 2 or more wires under 1 screw. Wires that have been attached to the receptacle screw have multiple wires under a single screw. You may have even have a single wire under each screw on each side. Turn off the power, remove the black wires, then simple twist the wires together, add a pigtail wire, twist them together with a wire nut, connect the pigtail wire to the screw on the receptacle. Do the same for the white wires by adding 6 inches of white wires to the 2 white wires, then twist the wires together and add a wire nut, and connect the white pigtail wire to the neutral terminal for a secure connection. A wire which is attached to the terminal isn’t wrapped clockwise around the screw, and it is stripped too far back and has exposed bare wire that can short out. The insulation isn’t stripped back far enough and the screw is tightened on the insulation which caused a poor connection. Strip the insulation back and bend the bare wire in a half circle shape and wrap it clockwise around the terminal. Ensure that only bare copper wire is under the screw. Tighten the screw to make a secure connection. If you live or do business in the Albany or Troy, New York areas, Lammon Electric can help with wiring problems. Give us a call today or view our main website pages to learn more about our electrical wiring services.